I have the hardest time reviewing fantasy books. I'm not sure why this is. Maybe because so much is constantly going on, it leaves me a bit stumped as to how to summarize everything in an eloquent fashion.Fans of traditional fantasy, whether it be adult or YA, will most likely appreciate this series. 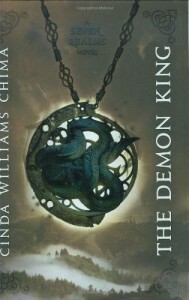 The Demon King read very much like a slightly scaled down version of a good adult epic fantasy - not much was held back for the sake of a younger audience.From the good to the evil characters, I found most, if not all, of them interesting. This doesn't happen often for me in books, which makes me look forward to reading the next installment.